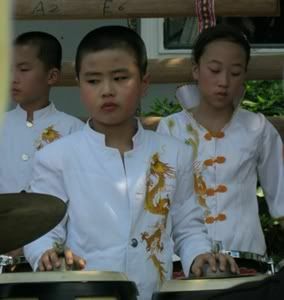 Featuring the cute little kids playing musical instruments and dancing. 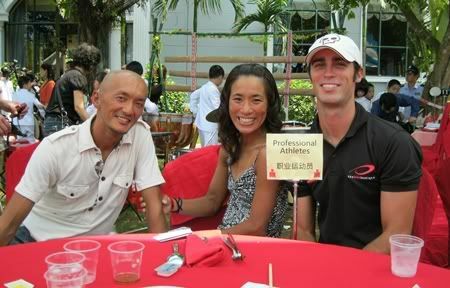 Sitting at the “Professional Athletes” table. A new friend for life! 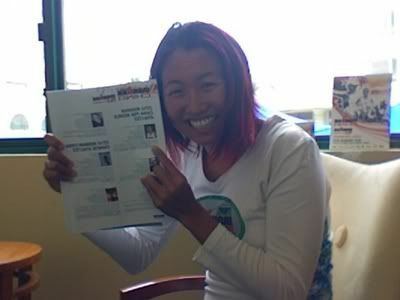 Kana, recipient of the Wongstar’s magical spare tube and CO2. 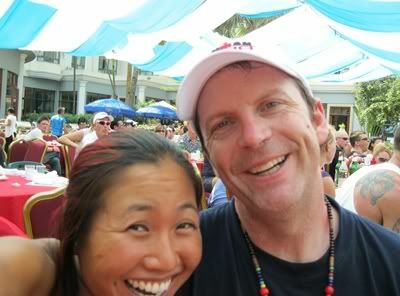 My buddy Larry, we met 2 years ago in the same local tri club training for IM China 2008. 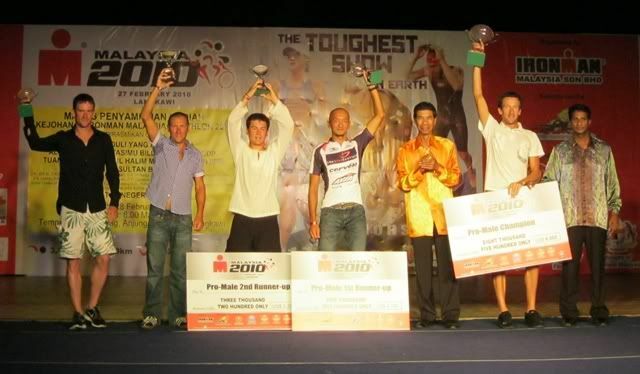 He then moved to Beijing to pursue his dream of becoming a Chinese movie director and I moved to all over the world to pursue my dream of becoming a professional triathlete. 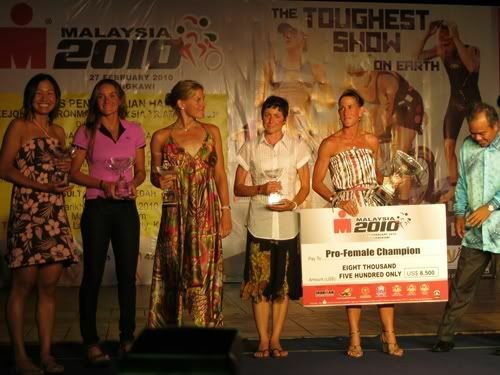 The pro chicks on the podium. Funny that I only missed getting called up by one spot! 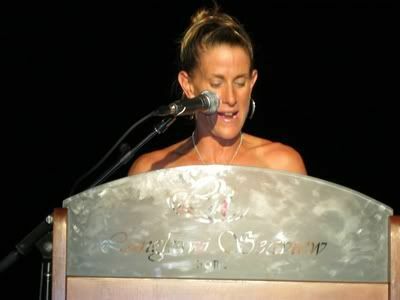 Amy giving her speech. She hates public speaking! 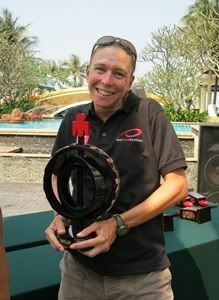 Amy with her sweet Ironman champion trophy. Yes, I was super jealous! With Steph Cox, media coordinator, who got to coordinate all my many many media requests. 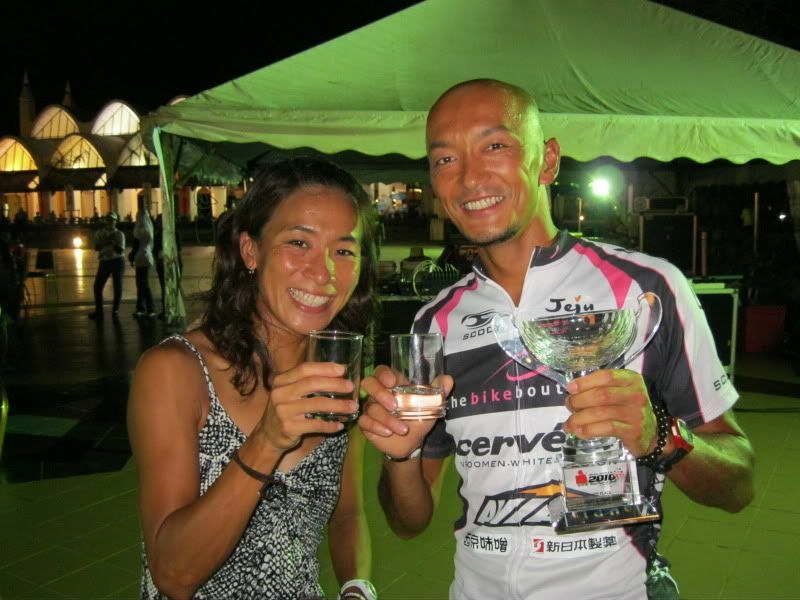 And then the incredible Shingo Tani, who is 42 years old and took 4th in the pro division. 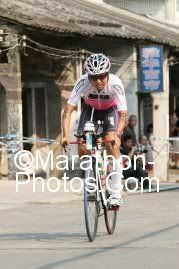 This wasn’t quite how I envisioned my third attempt at Ironman China: less than 1km from the finish line, kneeling in the middle of the street in downtown Haikou with some random Danish guy’s head in my lap for over 20 minutes. 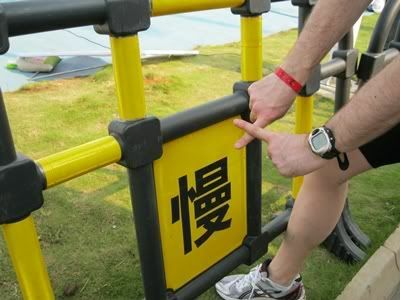 The worst part of the whole picture might be that I had only run 16km–I was only completing the first lap of my run. But let’s put this in perspective. I was not the one having a bad day. I was shuffling along nicely when I came upon the two Danishes, Morten and Andreas. Morten (in the red) was only 1km from winning his age group and badly cramping up. He was being supported by Andreas (in the white) who like me, was only 16km into his run, and so we both decided to help Morten limp his way to the finish line. There is the “no outside assistance” rule, but nobody ever says anything about getting inside assistance from your fellow race participants. By that point, what did I have to lose? 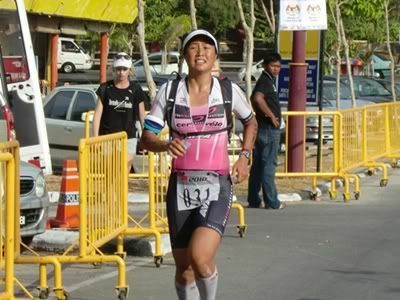 I had already been going so slowly that I was over 2 hours behind the women’s champion, my teammate Amy, and the difference between 13 or 14 or 15 hours was no matter to me, I just wanted to reach the finish line eventually. Given the opportunity not to be a selfish pro with the “every man for himself” mentality on this day, I leant Morten a shoulder for the next 20 steps. Then he got the crazy eyes. He had to stop. He had to lie down. I hailed for medical staff in my best Chinese, which came out of my lips in various dialects; good to know it’s in there somewhere for emergency purposes. Morten would get carted away in an ambulance and wake up in the medical tent later on, not even realizing that the race had started. He didn’t remember me the next day either. No. In perspective, I wasn’t the one having a bad day. 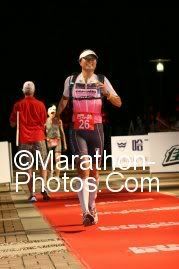 I had a really long and detailed and drawn out version of a race report I began on an airplane somewhere, but I think no one really wants to hear all about the over 14.5 hours of the longest Ironman of my life. I don’t want to dwell on it either, so I’ll just go over it a bit more concisely than usual. Which will probably still be longer than most people’s race reports. I woke up at 3am feeling terrible, feverish with a strong desire to vomit my guts out. The vomit wouldn’t actually come out until halfway through the swim so I just went into the race telling myself “you’re just nervous” because I wasn’t sure what was wrong with me. Now I’m pretty sure it was some food poisoning, but didn’t know at the time. Big thanks to Dughall from Singapore who lent me his extra BlueSeventy wetsuit–the river was unexpectedly cold and our new 2010 suits hadn’t yet arrived. I got out in 1:11, not as terrible as a 1:18 but not great, and actually beat another pro out of the water! Who knew that the swim would actually be the best part of my day for once? On the bike was when I realized I couldn’t go very hard or fast at all without feeling the bile rise in my throat, so I could only go very slow to avoid vomiting or passing out and crashing. I tried to be annoyingly optimistic as usual and just thought if I took the first hour easy, things would come around. After 2 hours, things still hadn’t come around, and I was crawling along but I made it my goal to finish the race, and decided to play it as smart as I could. I made sure I stayed hydrated and was able to get down bananas and water, even a little bit of Gatorade, when I stopped at the aid stations for some rest breaks. Indeed, it was like a “glorified century ride.” If I went slow enough I wouldn’t get the pukes. 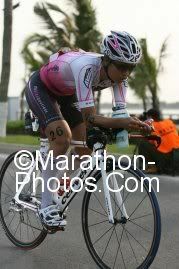 The hardest part was mentally fighting the demons that told me every 5 minutes to drop out of the race. 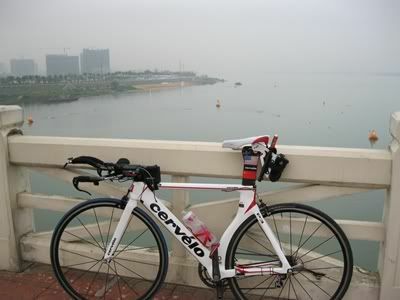 At about 80k I passed a Japanese girl walking her bike and crying. 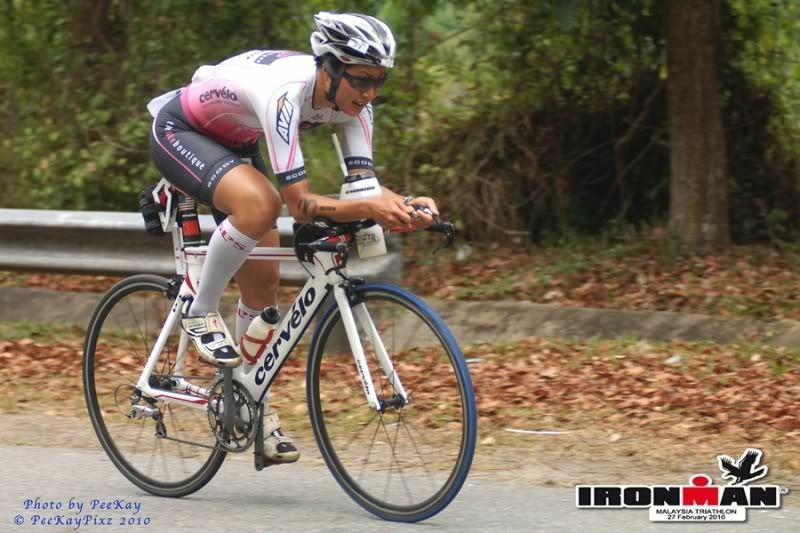 At this point I wasn’t passing anyone riding a bike, just the ones walking their bikes… It was Kana’s first Ironman and she had gotten two flats and was out of tubes and CO2. So I gave her a big hug, a tube, my CO2′s, helped her change the flat, offered another hug and off we both went. Kana would end up finishing the race and even took 2nd in her age group. All I was thinking at that point was back to my very first triathlon, a super-sprint, where I got a flat during the 7-mile bike ride and didn’t bring anything to change it…because it was a 7-mile bike. I sat on the side of the road pouting for a while until a very nice man threw me his flat kit and said “well I’m not gonna win this thing” and saved me from DNF’ing my first triathlon. What goes around comes around. I got pumped full of endorphins after my little mechanical support episode and actually felt great the next 20km, which took me through transition and the first 10k of the 2nd loop. This helped me from dropping out after one lap of the bike. Then I felt bad again. The next 80km, same story, a slow crawl with pit stops at the aid stations, which seemed to be spaced out much farther apart than when I go fast on a more normal day. I got out on the run and felt so-so. My insides felt a little twisted up and crampy but my legs felt ok, I was able to shuffle along decently and picked up my frozen coffee Camelbak at Special Needs pretty early at around 13 or 14km. I didn’t know if I could stomach the coffee but I knew I needed the calories for the long day still ahead, and solid food was not appealing to me. Luckily the milk in the coffee (which was still cold on this hot day) didn’t give me a bad reaction so I was able to sip on it per usual. Running in the daylight with many others around was easy. It seems that when the sun sets it becomes exponentially harder to stay motivated. 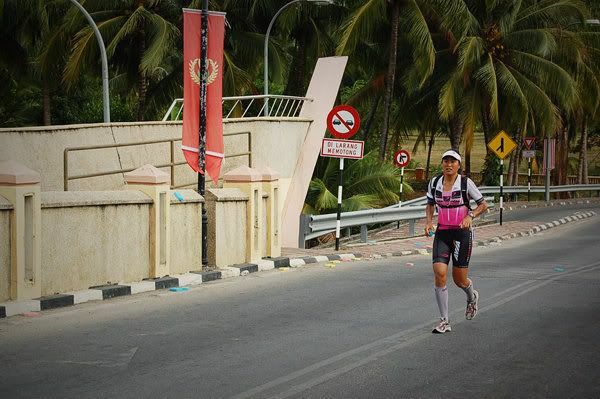 So what got me through…I kept thinking that yes, quitting is too easy, but finishing an Ironman is really not that hard compared to many other things that people go through. Like having to get a blood marrow transplant, and being a 25yo girl and having to shave your head for the chemo shots (my cousin Alvina…I cut all my hair off to support her last year, shaving my own head was too extreme). 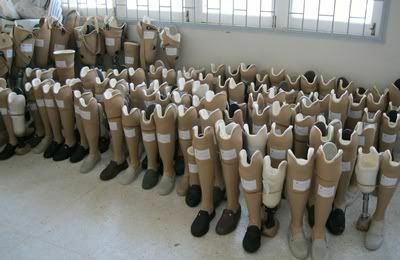 Or having your legs amputated like the patients I see as a prosthetist. 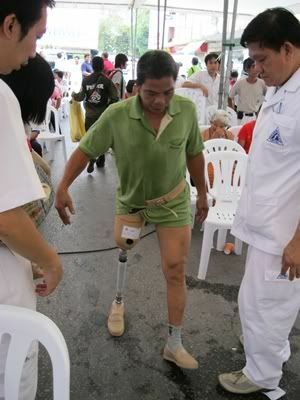 What about doing an Ironman on prosthetic legs? My legs were working fine. My stomach hurt a little but I could finish an Ironman. HTFU, it’s not that hard. Most of all I didn’t want a DNF Demon. I have heard the stories of how once you quit one, it becomes easier to quit the next time. I have had friends who haven’t finished and I know how disappointing it is. Well, I don’t actually know firsthand how disappointing it is, and I wasn’t about to find out. So it sure took a long time. I couldn’t believe how slowly the kilometers were going and it took a long time to get to that finish line, but get there I did, and I may have even been happier and smiley-er than usual. 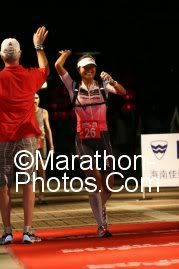 Finishing an Ironman will always be a great accomplishment to me, no matter what my finish time is. Thanks to all my sponsors and supporters for your continued support, you know who you are. 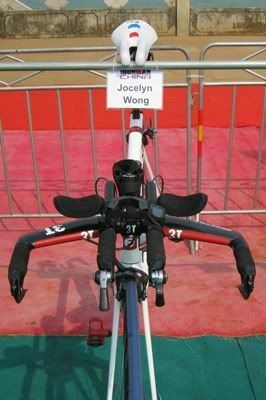 How to become an international triathlon superstar, step #8: Never quit. Thanks everybody for the concern about my race. The stomach bug I woke up with at 3am race morning seems to have cleared my system and I am feeling much better digestively today. Really annoying to feel so sparkly today when it’s the day after the race, but what can you do. 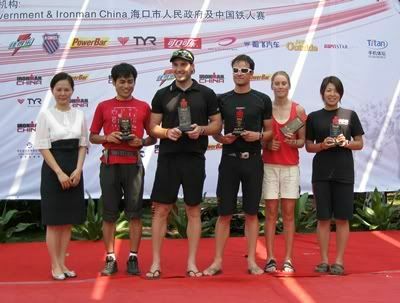 I didn’t come all the way to China for my first DNF so despite the vomit episode midway through the swim, I gutted it out…or at least trudged it out…really slowly…and got myself to the finish line before midnight. I still don’t know what time the bike cut-off time is and never thought I would need to worry about it, but I actually thought I might have been in danger of missing it yesterday. My slowest time before this race was a 13:50 and I now have a new PW (personal worst) at 14:37. I have even more respect now for the back-of-the-pack finishers. Running in the daylight with everyone cheering for you is one thing, but slogging away in the desolate darkness and the kilometer marks ticking by ever-so-slowly is just painfully forever. I badly wanted to quit so many times, but each time that little voice told me “Don’t quit. Don’t give up. You have all day to finish.” By default I still ended up 6th place in the women’s pro category thanks to the attrition rate (which I’m told was 27%–over 1 out of 4 competitors didn’t make it). 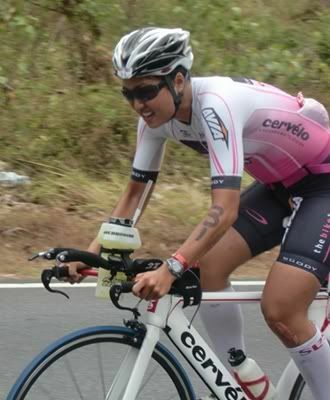 Was super stoked to see Amy with the lead bike heading to the finish line when I just got onto the marathon course and Maki holding onto 4th position. Mat, Hiro, and Brandon all finished top 10 as well! Not my best day at all, and some may say I am stupid and stubborn, but I am still very proud of this finish, because dammit, I finished. It took an exceptionally long time and maybe less time if I didn’t stop and help a couple distressed competitors along the way, but I’ll save those stories for the race report. 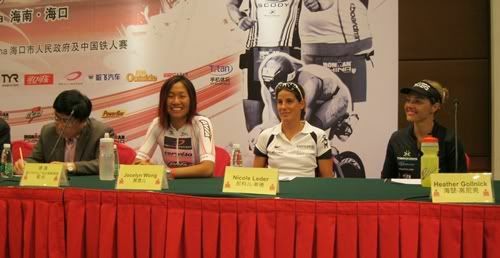 How to become an international triathlon superstar, step #7: Embrace the fame and enjoy it while you can, where you can. superstar!! really, I am now a big deal here. 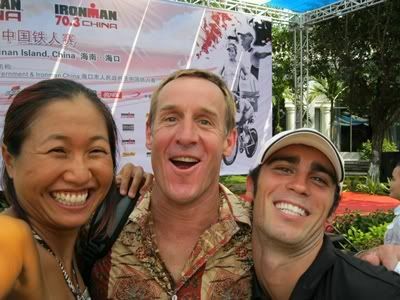 This is the third consecutive year I’ve come to Haikou, China for the Ironman. 2 years ago I was a very scared and unfit age grouper, it was my first race as a teamTBB development athlete and the Boss had thrown me into the pro division. I melted in the heat and finished in 12:44. Last year I had a terrific race and took an hour off my time, finishing in 11:08 (a new PR at the time), thrived in the heat with the 3rd fastest run split and ended up on the ESPN International broadcast as the featured athlete. 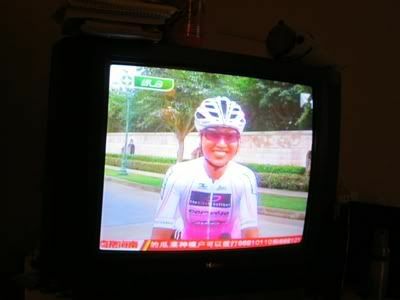 Actually, I had to convince the producer, Peter Henning, to put me on TV. I told him I wanted to become famous. Nobody really knew who I was or really cared! So, what is it like to suddenly become famous? Well let me tell you, as I’ve also documented this quite well; life is short and who knows if it’s just my 15 minutes of fame!! In line for the flight to Haikou the girls behind me saw the Wongstar Hello Kitty bike box and the new punk red highlights in my hair (good luck red for China) and asked if I was a rock star. “Kind of,” I said, slightly amused and only half kidding. 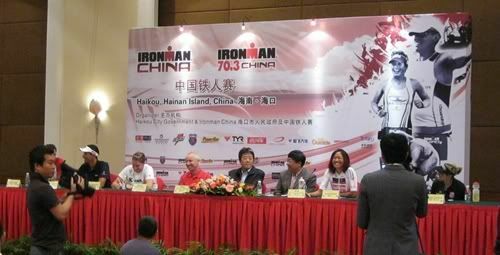 I was invited to my first press conference–ok I know I said Ironman Malaysia was my first press conference, but really any and all of the pros that showed up were told to get up on the table. 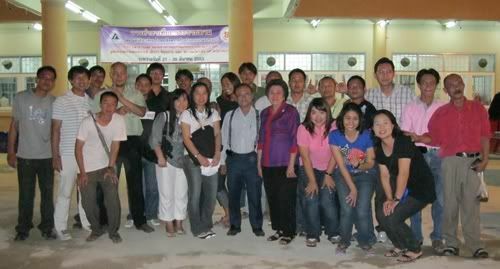 Here there were only 6 of us that were invited, and with special name tags too (with our Chinese names). 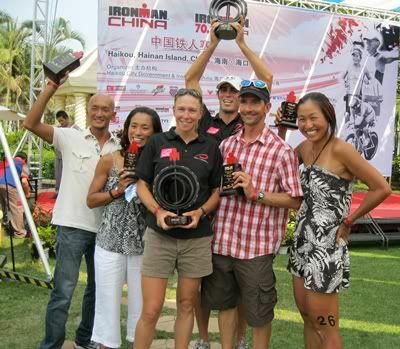 World champ Chris McCormack, Lothar Leder (first guy to break 8 hours), and then multiple Ironman champions Luke McKenzie, Nicole Leder, and Heather Gollnick. part of me is not sure I belong at this table, the other part says "yeah you do!" 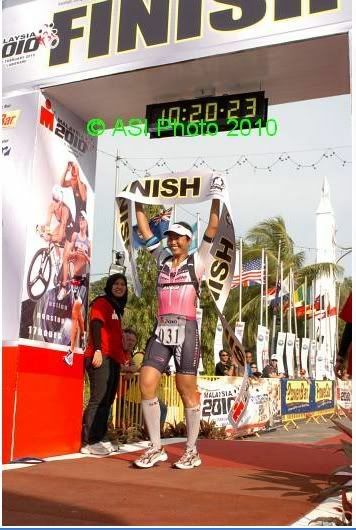 And Heather actually won the first Ironman I ever did–Wisconsin 8 years ago. How am I sitting at the same table with them, and they think I’m the famous one?! Lots of interviews followed the press conference. I lost count of how many times I’ve been interviewed here. 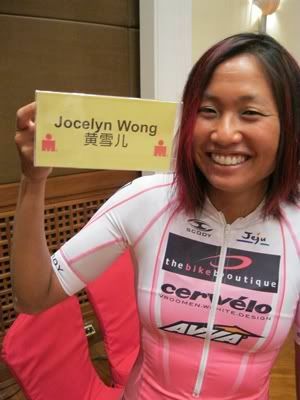 I can say that I’m the only pro triathlete here with a real Chinese name–the rest of them had phonetic translations of their English names. sounds like "Wong Sure-Er" which sounds like "WongSTAR"
Some of us were also invited to dinner at Coffee World/Pizza Corner, the food and beverage sponsor of the race. A lot of local media, fans, and other racers were invited to ask us questions and meet us. 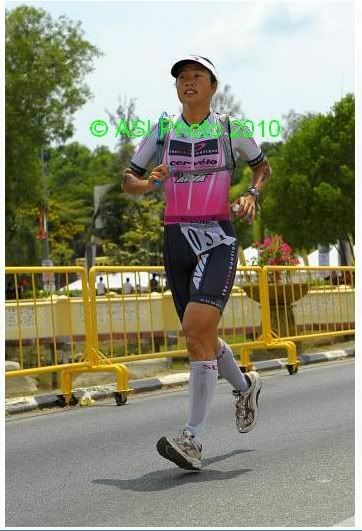 Dong Qi is the local Chinese triathlete who also raced in the pro category in 2008. I actually finished about 15 seconds behind him and we are both planning to go hours faster this year! He is the local favorite for guys, and apparently I am the local favorite for girls. one of the pizza employees who is a college student. I told her I worked as a waitress in college too. 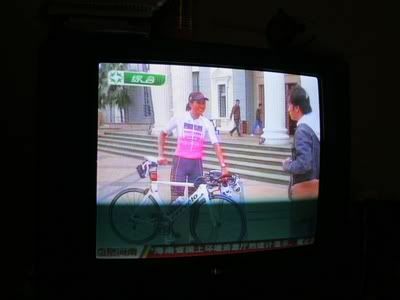 The local news station wanted to take video of me running and biking and have me say something cute in Chinese. “Cheer for me on Sunday!” which I totally slaughtered phonetically but apparently got the accents correct. 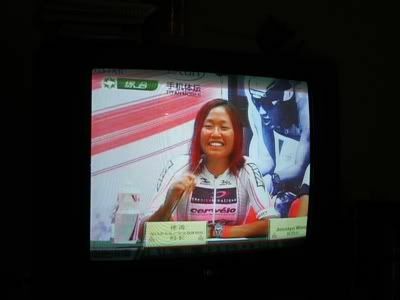 So after a day of interviews and appearances, I managed to get back to the hotel room in time before the carbo dinner to catch myself on TV! White Tiger makes his TV debut! 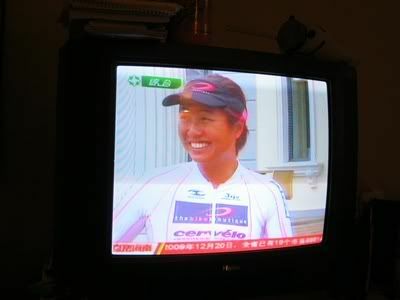 This smile was made for TV! Almost anyone who gets in the elevator with me recognizes me and every other person who walks by as I blog in the lobby waves. Sometimes I hear whispers of “Wongstar” as people pass. I’ve been meeting people all over the world who are following this blog!! People keep asking to take photos with me when they meet me in the lobby or hallway or during dinner or the expo. It’s INSANE. The whole thing is just crazy. The day this becomes NORMAL at all my races will be madness. And you’ll be sure to hear about first! 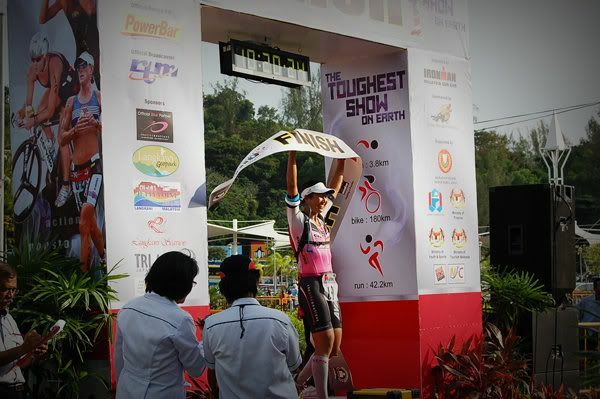 The “Toughest Show On Earth”–that’s what was written on all the banners and race materials for Ironman Malaysia. 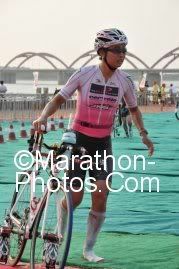 Crossing the line as 5th woman at an M-Dot Ironman is something that I had never fathomed when I watched my first Ironman as a volunteer and spectator almost 10 years ago. My 18-year-old self just wondered if she could finish one. Before midnight. 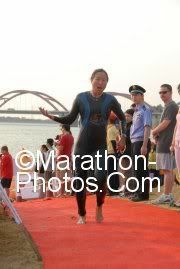 I was mostly worried about making the 2hr 20min swim cut-off. Even a year ago, I’m not sure I imagined I could do this well. And leading up to this race, I wasn’t sure what to expect. Not to say that I have no goals or expectations…it is just very different to hope and dream and wish certain things and then to have them actually happen in real life. Or maybe it’s more that I have been told to be very patient, so I thought I would have to wait a little bit longer. Either way, Coach says this is part of why I do well. Apparently my expectations (or lack thereof) keep me from getting a big head and blowing up from overconfidence. But I am getting ahead of myself. The swim was an out-and-back straight line into the salty sea. Swim out 1900m and then turn around and come back. I was fighting in the pack the first 15 seconds and then found myself with Miranda Aldritt, just the two of us together. We smacked each other at first and then she went ahead and I stayed on her feet, though she slowly crept ahead. I’ve been working on yet another new swim technique but Coach said to just “swim hard” however which way I wanted. When we got to the turnaround, I looked at my watch for the first time and yuck…46 minutes!!!! Oh sweet baby Jesus. No way am I finishing the swim in over 90minutes! Newly inspired (or rather, horrified at myself), I swam as hard as I could all the way back. Apparently there was a current against us going out, as my second half only took 32 minutes. Swimming 3.8km on your own is much harder than in the giant washing machine of age groupers–heading back the water suddenly became more turbulent from the masses of amateurs swimming the other way; I really thought there were extra boats out there or something. Swimming in the Krabi pool with no lane lines proved to be good practice for open water swimming. Dear God, if I can't have world peace, how about a little bit of swimming ability? Just a little? 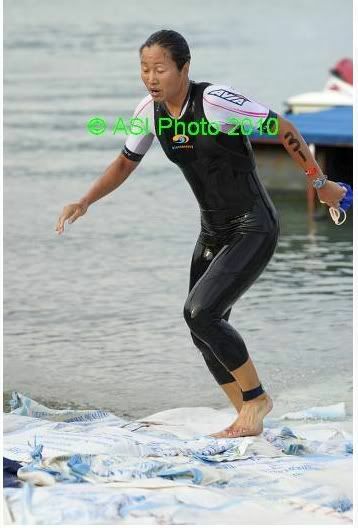 I jumped out of the water as last place female pro, slightly less horrified that my watch said 1:18 and not 1:28 or worse. I launched straight into the “Damage Control” game, also known as the Denial Game, where you tell yourself everyone must have swam slow today. By like 10 minutes. Thus you don’t get freaked out or panicked or depressed and ruin the rest of your race. I am getting really good at this game. I got on White Tiger and stuck to Coach’s race plan for me: swim as hard as you can, hold back on the bike by 15-20 minutes, and then run them all down. Race smart and beat the people who you weren’t meant to beat. Patience, patience. 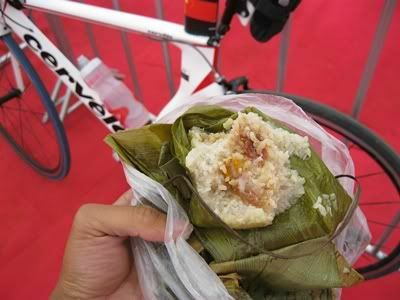 I focused on getting the nutrition down–Gatorade at the aid stations and Hello Panda cookies in my bento box. The bike course was hillier than I expected, and some of the road surface wasn’t very smooth or fast. I just rode solid, holding my pace steady and increasing the effort as the ride went on, but never going balls-out, and passed the first pro woman around the 3-hour mark. the coolest bike pic in the world, as mentioned before. Then something weird happened. Towards the end of that third hour, I passed 3 more pro women, all in a row. Maybe everyone really did swim bad. Maybe they were already blowing up from the heat? It wasn’t too hot, if you were biking fast enough it was almost breezy… Strangely enough our national anthem, the Star Spangled Banner, started playing in my head…I think because Coach had always said that at hot races, those who went out too hard would start to detonate. But if I paced myself well, I would be bomb-proof. “The rockets red glare, the bombs bursting in air, gave proof to the night…that our flag was still there…” I think subconsciously I was bitter that I missed most of the Winter Olympics. The fourth and last lap of the bike, that last hour, the aid stations ran out of EVERYTHING. No Gatorade, no water. I forced myself to keep eating my Hello Panda cookies…you need this nutrition, eat it!! And 2 or 3 aid stations later finally got a small bottle of water to wash it down my dry throat. Everyone else was in the same situation, I figured I would rehydrate on the run…Camelbak time! I rolled over the timing mat with a 5:20 bike split, hey not too bad for holding back 15-20mins eh? 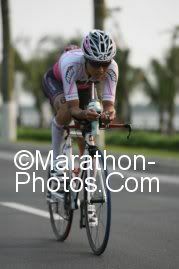 It ended up being the 3rd fastest bike split too, rockin’! grunting my way up the big hill with Maki yelling "SUGOI!!!" Got into transition and asked the volunteers in the change tent how many women had come through. “only 5. you are number 6!” NO FREAKING WAY. The run was 5 laps, about 8km out-and-back each. 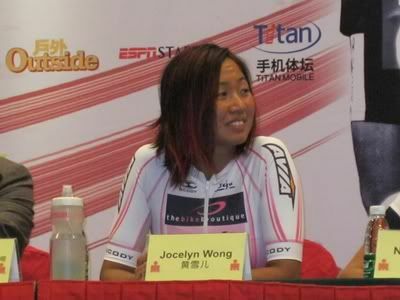 Now as much as I like to perpetuate the urban legend that the Wongstar does not feel heat, I could tell it was hot. Someone later said 39*C, someone else said 41*C (that’s 102 to 106*F), but I wasn’t worried. I was thrilled. In a very twisted way, I find that racing in the heat is much easier than training in the heat–there are aid stations every kilometer giving out cold drinks, ice, and cold wet sponges. When do you get that in training? Umm, how about NEVER. I had my two Camelbaks ready (one in T2, one at Special Needs) and would take in 1.5 liters of Gatorade the first 2 laps and then 2 liters of thawing frozen coffee the last 3 laps. I had even debated on filling them up all the way but was glad I did, I actually finished everything I carried and needed extra Coke at the aid stations when the Camelbaks went empty. I would run through the aid stations and grab a couple cold sponges at each one, squeezing them over my head, sipped on my Camelbak and plodded along, nothing spectacularly fast. Just holding about 5-minute k pace (about 8-minute miles). 3:30 marathon pace. Which I guess is somewhat fast in hot conditions? So I was 6th woman and just held steady. Heading out on the run loop seemed warmer, and then coming back there was a bit of a breeze–so I enjoyed coming back more, plus it meant going back towards all the cheering spectators. One Asian spectator was wearing an American flag T-shirt and yelled “Japanese!” to me as I went by the first lap. “NO, American! !” I yelled back. From then on, he and his friends would chant “USA!” for me every time I ran by. There were also many people I had met through training and racing around the world that cheered for me, both on the race course and on the sidelines. The support was overwhelming, lots of cheers for both Wongstar and Jocelyn…even the Korean athletes who I had competed with in Jeju or GreatMan would yell “hwai-ting!” as I passed them. 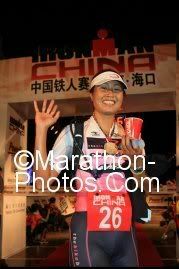 The Asian female spectators were especially enthusiastic and I was hoping maybe they’d catch a little bit of inspiration seeing an Asian girl at the front of a race…I do my best to represent! I had this song in my head…the DJ Tiesto version of Maroon 5′s “Not Falling Apart.” Coach has taught me to develop a bomb-proof marathon shuffle, so that’s what kept going through my mind, “…I’m not falling apart…” Turns out my 3:37 marathon was 3rd fastest among the pro women–only 6mins slower than champion Belinda and within 11mins of Edith’s run split (the fastest for the day)…huh…since when does that happen? Brilliant race plan, Coach, and good execution by the Wongstar! When I switched out the Camelbaks after 2 run laps, I was super happy that freezing the coffee had worked amazingly. I too, was still feeling amazing and not really affected by the heat much until the 4th lap–that’s when I started filling my sports bra with ice. I think the humidity actually picked up, rather than the temperature. heel-striking, Coach would be proud! Lap #1, yes I went out of order. Somewhere along the way I had slipped into 5th position, and I was starting to run down 4th and 3rd…but ran out of time and distance. By Lap 5 I really just wanted to be DONE! I was feeling decidedly less SUPER. Finally went by our hotel one last time, but then there was another 2km to the finish line back at the jetty, and it was THE. LONGEST. TWO. KILOMETERS. EVER. I did the winner's pose. I felt like a winner. And finally, there it was. I was so happy, I felt so strong the whole day–if I had to choose just one word to describe how I felt for the race, that would be it. STRONG. (I thought this during the race too.) Ok, maybe not in the swim but the other 90% of my day… I am still amazed I only ran 10mins slower than my best Ironman marathon, and in much tougher conditions… STRONG!!! 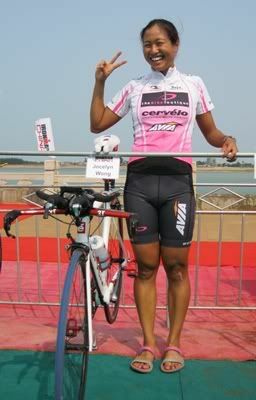 All our equipment sponsors: Cervelo, Avia, BlueSeventy, 3T, Scody & ISM Saddles for the gear that helps me go faster. I still scratch my head and think “really? we get new stuff every year?” But I’m not complaining! My travel sponsor, Mark Cathcart, for help funding the travel expenses. You’ve known me since I was a delusional age grouper with dreams of becoming a triathlon superstar. Thanks for always believing in me and fueling these dreams! My newest sponsor, Haamonii Smooth Shochu, for the post-race celebratory beverages. Thanks for your support and the good times had and to be had in sharing harmony around the world! Photos courtesy of ASI Photo, Maki Nishiuchi, Pee Kay Pixz, Makoy Almanzor–thanks!! this is so freakin’ cool that it deserves its own post!!! click on it to see a bigger version! When you are an aspiring international triathlon superstar, you make all kinds of friends around the world, especially those with fancy cameras. The one above is courtesy of PK, a working freelance photographer and owner of Pee Kay Pixz. 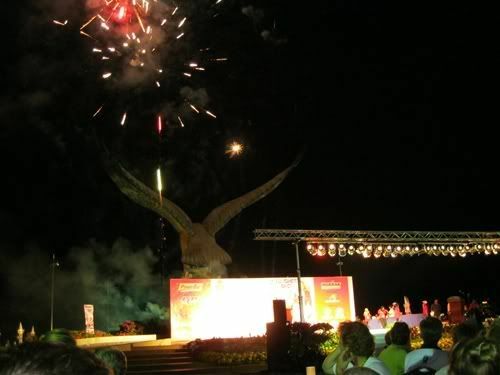 He is currently uploading last weekend’s photos to his online portfolio, the album is at http://PeeKayPixz.zenfolio.com/imlangkawi2010 and he will also be adding some team photos over the next few days to our own team album at http://peekaypixz.zenfolio.com/teamtbb. 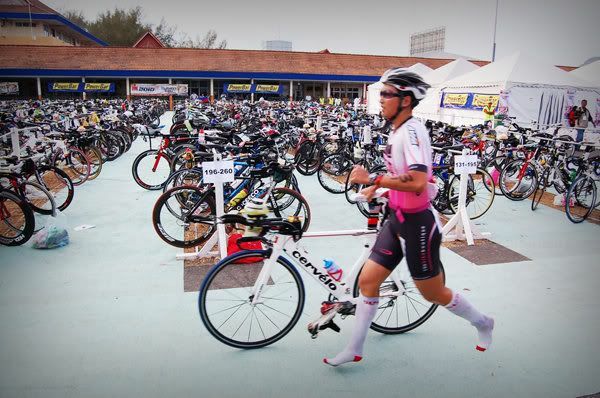 Thanks for the awesome pic PK, and for beautifully capturing White Tiger’s debut at Ironman Malaysia! LOVE IT! :D will include it in my race report coming up next! 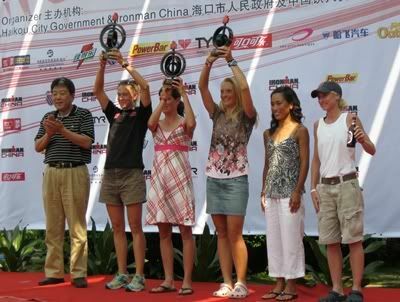 How to become an international triathlon superstar, step #6: Get called up on stage to win a cool trophy, and learn to use said trophy appropriately. Who cares about the race, how about the awards and the after party? Mom & Dad want to see that sweet trophy I won! 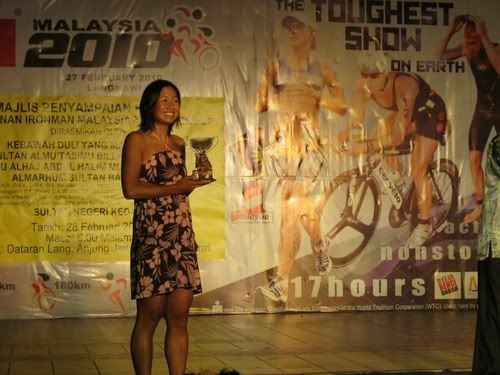 So this was my very first awards ceremony at a WTC Ironman event where I got called up on stage as a pro! CHEESE! I think I am the happiest! It was a little surreal actually, standing right next to former teamTBB alumnae girls Belinda & Hillary who had taken 1st and 3rd. Years ago as an age grouper I had really looked up to them and wow, things have certainly changed. raise your crystal trophies up and yell HUZZAH! 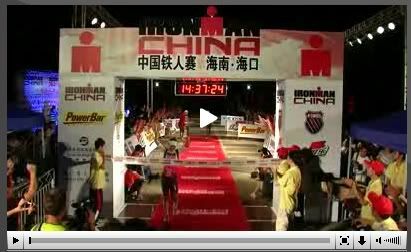 I couldn’t help thinking of the awards ceremony at my first Ironman 8 years ago, when I sat with my mom looking at the faster athletes getting called up on stage. I told her I wanted to be up on that stage one day. She had said “Of course you will some day” but moms are supposed to say things like that. And I didn’t actually mean up on stage for the pro category, I would’ve been quite happy with getting top 5 in my age group! 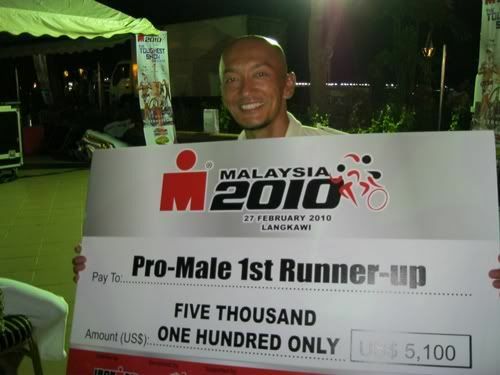 I’ve never even won my age group in an Ironman! 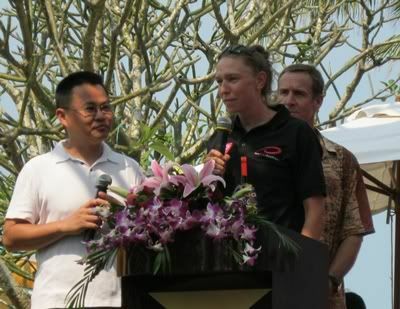 Belinda making her speech. I took some mental notes. Hiro and his big paycheck! He was like team captain for the weekend. 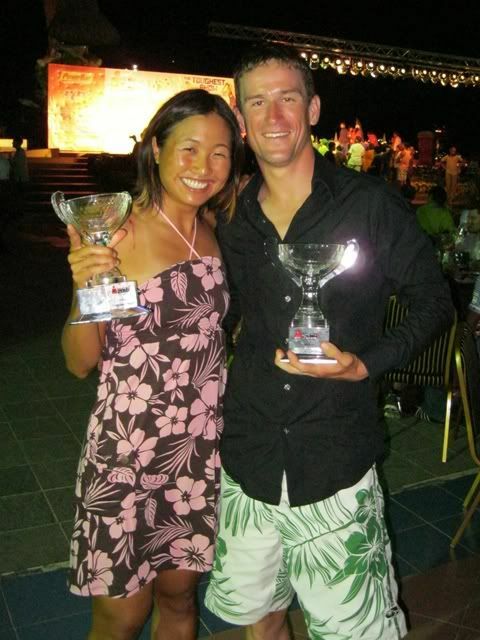 Sometimes the awards ceremony is a bit of a drag, but not when you have Haamonii Smooth Shochu as your liquor sponsor! Maki says her dad drinks shochu every night! 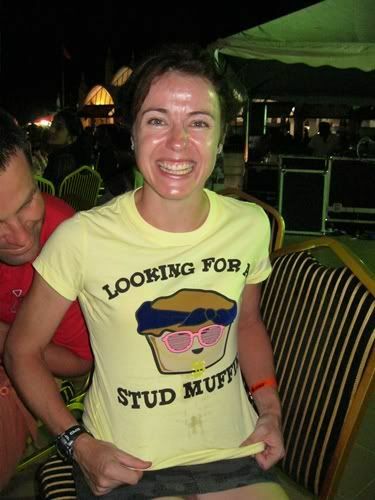 did she find a stud muffin? did she?? He didn’t make the money cut-off either. Thus, we would soon make good use of our very practical trophies. all done! best awards presentation ever! 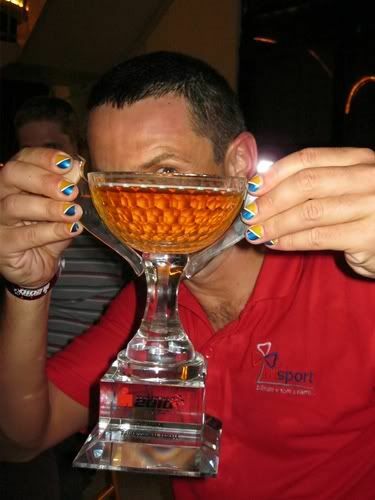 It was then on to more celebrating…so what was it I said about our trophies being practical? 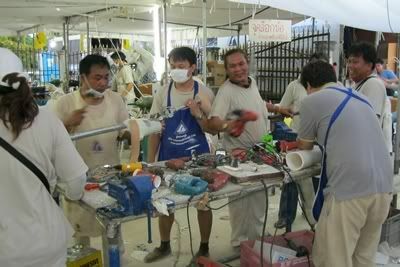 I was told that they were made of local Langkawi crystal. The new trophies and new friends helped ease the bitterness of not winning any money this weekend! 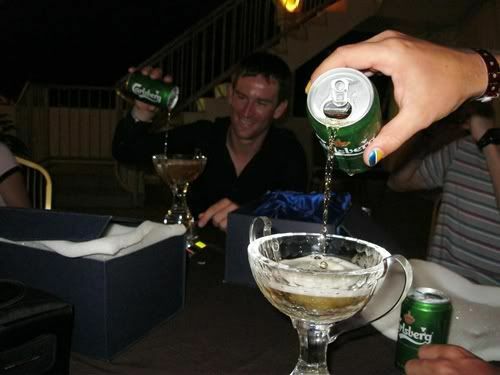 no prize money, someone else buy the drinks! Disclaimer: the Wongstar encourages responsible drinking. 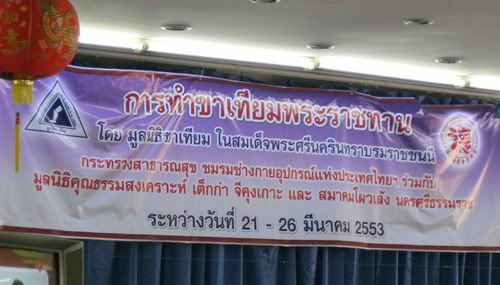 Please don’t drink and drive. 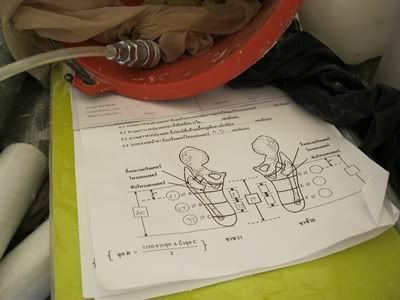 However, if you are a nerdy guy trying to impress a nerdy girl, by all means attempt to drink and derive. 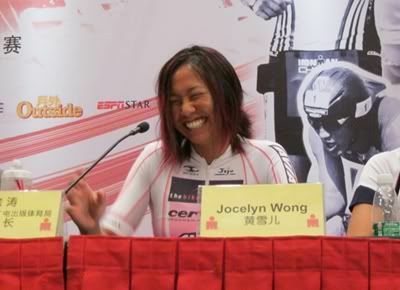 You are currently browsing the Jocelyn Wong's Blog blog archives for March, 2010.